"Working in a media market where reporters risk abduction and detention by the military for doing their jobs, Khaosod English never lack for wrongs to bring attention to in our reporting. Where we struggle to serve our readers is in bringing more attention to the "rights," those exceptional examples of something happening with a net social gain. 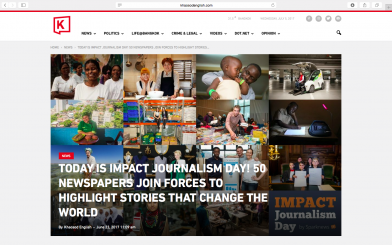 We see Impact Journalism Day as a sort of incubator for such stories, and joined to have a shared platform to achieve some synergy on themes and coverage with our friends around the world."